Multiple accounts & multiple calls user agent intended to work as a basic SIP test application. Not recommended for general use. 2012.12.13 tSIP_0_2_0_bin.7z, tSIP_0_2_0_src.7z, based on re/rem/baresip 0.4.2. 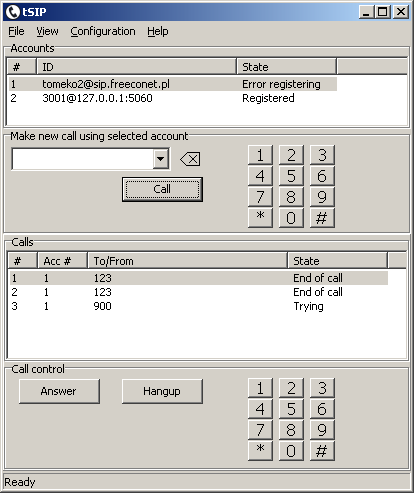 Previous simpler single account / single call may still be prefered. 2013.07.04 tSIP_0_2_1.7z, fixed Access Violation occuring when account list was empty.